Come show me how ye bury yer treasure, lad! Avast! T’ undersigned (“t’ Scurvy Bilge Rat”) agrees t’ maintain in confidence all information, includin’ information o’ a business or technical nature, relatin’ t’ any and all products, services, and business plans bein’ developed by Pirate, includin’ but not limited to, any and all proprietary information directly or indirectly disclosed t’ t’ Scurvy Bilge Rat by Pirate, whenever received by t’ Scurvy Bilge Rat. It be agreed that “proprietary information” shall not include t’ followin’: 1) Information which be in t’ public domain through no fault o’ t’ Scurvy Bilge Rat; 2) Information which be received, without binder o’ secrecy, from third parties havin’ no obligation o’ confidentiality t’ Pirate; and 3) Information which was already in t’ possession o’ t’ Scurvy Bilge Rat, without binder o’ secrecy, prior t’ discloaye tharof by Pirate. Proprietary information disclosed under this agreement shall not be deemed t’ be within t’ foregoin’ exceptions merely because portions o’ such information or more general information be in t’ public domain or in t’ possession o’ t’ Scurvy Bilge Rat. 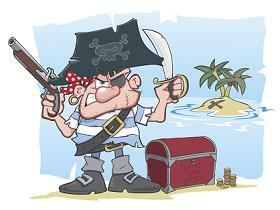 T’ sole purpose o’ this discloaye be t’ enable t’ Scurvy Bilge Rat t’ evaluate a possible business agreement with Pirate. This agreement shall not be construed t’ grant t’ t’ Scurvy Bilge Rat any license or starboards except those specifically granted herein. T’ Scurvy Bilge Rat shall not make any copies o’ t’ proprietary information without prior consent o’ Pirate. Furthermore, t’ Scurvy Bilge Rat agrees not t’ make any commercial use o’ any proprietary information received hereunder. Upon request, t’ Scurvy Bilge Rat shall promptly return all documents and items disclosed under this Agreement, and copies tharof t’ Pirate. This obligation o’ confidentiality be perpetual from date o’ signature. Arrr!